My grandma was a superb cook back when she was still alive. I would normally see her painstakingly prepare each dish for our family. She would wake up early in the morning to prepare our breakfast, cook food for lunch and dinner… and she would do this every single day. I guess it is from her that I learned to love and enjoy cooking. 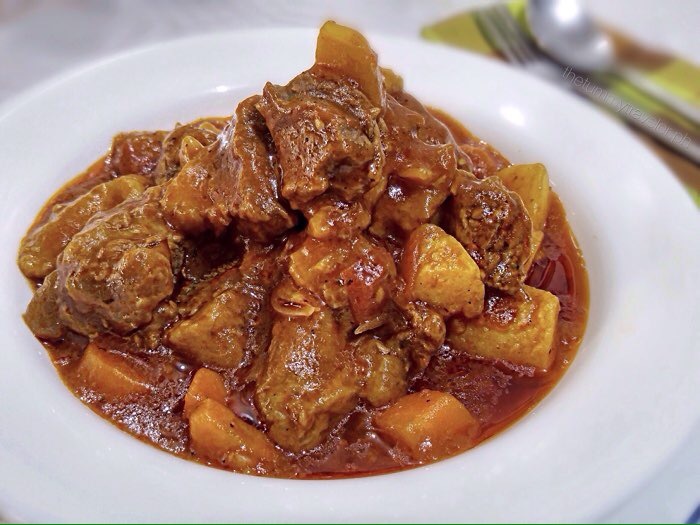 Her culinary repertoire would include Kare-Kare, Pork Binagoongan, Morcon and so on. But this one dish that I truly miss eating which she makes mostly on weekends is Beef Mechado. And so, I tried recreating it myself so my family especially my kids would somehow get the idea of how my grandma would cook it. Cooking Beef Mechado was very nostalgic for me. It brought back a lot of childhood memories. Enjoy! 1. Bring the beef chuck to a boil until tender. I always use my mother-in-law’s Saladmaster to lessen the cooking time. But other pressure cookers work well, too. Once the beef is tender, set aside. 2. In a pan, heat oil and saute garlic, onions and tomatoes. The more tomatoes, the better and tasteful your sauce will become. 3. Add in the pre-boiled beef and mix. Then add tomato sauce and mix again. Simmer and cover for about 5 minutes in low fire. 4. Add the tomato paste until the sauce thickens. Mix. 5. Add about a tablespoon of Lea & Perrins and salt & pepper to taste. If the sauce is too thick for you, you may add a little water until you’ve reach your desired consistency. Season to taste again. 6. When the oil of the sauce has surfaced, add in the pre-boiled potatoes and carrots. Make sure not to mix it so much as the pre-boiled potatoes and carrots might get smashed. 7. Serve in a nice bowl while hot. As much as we Filipinos love to eat Beef Mechado with steamed rice, a buttered toasted baguette goes well with this, too. I love topping my baguette with some mechado meat and lots of sauce. You can also try scraping the sauce of the Beef Mechado with your baguette. Noms!